MacroMania: Is Bitcoin a Safe Asset? You're probably thinking no, of course not. The dollar price of bitcoin can be quite volatile (see here). One can easily gain or lose 50% over a very short period of time. So if we're talking about an asset that offers a stable rate of return, Bitcoin ain't it. Except that this is not what I mean by a safe asset. I'm not even sure how to precisely define what I mean by safe asset. Loosely speaking, I'm thinking about an asset that people flock to in bad or uncertain economic times. In normal times, it's an asset that is held despite having a relatively low rate of return, perhaps because of its use as a hedge, or because of its liquidity properties. U.S. dollars (USD) and U.S. treasuries (UST) are examples of safe assets today. Now, you might think that they're safe because they're close to risk-free in terms of what they promise in the way of a nominal rate of return. A paper USD promises a zero nominal interest rate and you'll be sure to get that if you hold on to the note over time (USD in the form of central bank reserves presently earn 1/2%, but only depository institutions get this rate.). A UST bill also promises zero nominal interest and you can be sure to get that with full principal repayment upon maturity. The coupon payments associated with a UST bond are virtually risk-free. But that's not a complete way to think about the risk associated with a security. First, economists (rightly) focus on the real rate of return on an asset. Investors don't care how many paper dollars are promised to them in the future. They (presumably) care about the purchasing power of those future dollars. If inflation turns out to be high, that future purchasing power will be low. The opposite holds true if inflation turns out to be low. As for the "risk free" UST bill, its market price will generally fluctuate between the issue date and maturity date. This is sometimes called "interest rate risk." If you buy a bill that promises $100 a year from now for $99, you will make about 1% if you hold the bill to maturity. But if market interest rates spike up in the interim, and if you are forced to sell your bill to raise cash, you're likely to realize a substantial loss. That's the thing about a safe asset. It's return can appear to be stable for long periods of time and then--bam--something happens. (Something always happens.) Interest rates may spike up--a sudden sell-off in bonds may occur. What might trigger such an event? All sorts of news. Foreign banks may need to liquidate their foreign reserves consisting of USTs for political or economic reasons. A sudden increase in inflation expectations would lower the expected real rate of return on nominal bonds, inducing a sell-off. A bond sell-off might even be triggered by a good news event. An increase in productivity growth increases the expected return on private capital investment, inducing portfolio substitution out of bonds, for example. Another thing to keep in mind is that the asset classes that constitute safe assets can change over time. In my recent piece on secular stagnation, I noted that a "flight to safety" seems to occur near regime changes that imply productivity slowdowns. In 1974, investors flocked to gold and real estate--they ran away from USD (rapidly rising price-level) and UST (rapidly rising nominal interest rates). In 2008, the situation was quite a bit different--both USD and UST were highly sought after safe havens (with investors fleeing real estate). The observations above suggest that the monetary policy regime matters a great deal for whether a fiat currency is perceived to be safe or not. When Nixon and his advisers chose to abandon the gold standard (against the recommendation of Fed chair Burns) in 1971, monetary policy appeared to lose its nominal anchor. So when the oil price shocks and productivity slowdown hit in the early 70s, investors ran away from cash. Gold is often credited as being a safe asset because of its supply "policy." But there must be more to it than this because, like gold, the supply of real estate is not very elastic. And yet real estate was not a safe asset in 2008. A "safe asset" is an asset that can be used to transact without fear of adverse selection; that is, there are no concerns that the counterparty privately knows more about the value of the asset. (Safe Assets, Working Paper, March 2016). In other words, a safe asset is an object with attributes that traders can mutually agree on very quickly and at little cost. Objects with this property tend to become monetary instruments or, to use a more broad term -- exchange media (which includes objects commonly used as collateral to support lending arrangements). Safe assets tend to be "simple" assets. Historically, commodities such as salt, precious metals, or coined tokens. It's easy to verify your salary in salt (just taste it). It's a bit more difficult to assay gold. The whole purpose of coinage was to make objects easily recognizable without much effort. Cash and gold are "simple" objects. The fact that they pay no interest makes them even simpler. In particular, there's no need to spend time investigating the reliability of a dividend paid by "barren" asset--everyone can agree right away that the dividend is zero. This type of informational symmetry appears to be in high demand in times of financial uncertainty (when nobody knows for sure what other people know about the securities they're selling.) Of course, the situation is somewhat more complicated when counterparties (intermediaries) are involved, but this is true of any asset. This brings me to Bitcoin. I think that Bitcoin could be the world's next great safe asset. At least, it certainly seems to have all the properties that are desired in a safe asset. Importantly, it is a "simple" asset. It's simple in the sense that it's a pure fiat object--the monetary objects (called bitcoin) constitute no legal claim against anything of intrinsic value. Bitcoin is simply a record-keeping technology (and economists have known for a long time that money is memory). It pays no interest. Possession corresponds to ownership (unless counterparties are involved). The ledger has proven itself secure (not a guarantee that is can never be compromised, of course). Now one might object that Bitcoin is not that simple, not to the average person on the street, at least. Bitcoin consists of 30MB of C++ code. And the algorithm that governs the accuracy and security of the ledger can be hard to understand. But I liken this to the way most people understand how their car engine works. We have a vague notion of how internal combustion works, how power is transmitted through the drive train, blah, blah, but all we really know for sure is that our collective experience with the technology has proven useful. We also know that there are mechanics out there that do know how a car engine works. Because the Bitcoin code is open source software, attempts to modify the code for personal gain at communal expense are easily detectable through expert eyes. And we trust that there are many expert eyes on the watch. Finally, Bitcoin has a very simple monetary policy. Essentially, the policy is to keep the money supply fixed (actually, it will grow asymptotically to a fixed number, 21 million units). Although this money supply rule could potentially be modified by communal consent, there are reasons to believe that this is unlikely to happen. And even if it does happen, it can only happen if it somehow serves the community of Bitcoin users in some broad sense. However, even if Bitcoin is not, in my opinion, a particularly ideal monetary instrument, this does not preclude it from serving as a safe asset or longer-term store of value. Once market penetration is complete, its return behavior is likely to mimic the return behavior of any other safe asset. Safe assets generally earn a low expected return (that is, they are priced dearly). Investors can expect to earn unusually high returns in a crisis event. But if you buy at the top, you can expect to realize unusually high losses when the crisis subsides. In short, it's a great investment -- assuming you can predict when a crisis will occur and when it will end! There are a host of issues related to safe assets that I think deserve some attention. Let me offer a few that come to mind here. First, it's not even clear that safe assets are socially desirable. Bryant (2005) demonstrates that the existence of a safe asset can induce coordination failure. Is this an argument to be taken seriously? Second, I think that policymakers should be aware that the class of safe assets may change over time. Should policy be conditioned in any way on the existing set of safe assets? Third, how should we think about "close-to-safe-asset" substitutes that seem to proliferate in periods of prolonged economic tranquility? Barren assets like cash, gold and Bitcoin generate no income. It is evidently very tempting to construct "safe senior tranches" of private interest-bearing debt to compete with these low-return barren assets--a practice that sometimes gets out of hand--and with disastrous consequences. Should a central bank issue its own interest-bearing digital cash to discourage the practice? Insteresting. I would have called the repo of the Treasury bond the safe asset, not the Treasury itself. Your post points to some serious issues with the nomenclature used in this literature. It is the treasury that is rehypothecated (spent), not the repo contract. So I think I'm right in identifying the UST as the safe asset, not the contract that surrounds it use (repo). But as you correctly observe a Treasury bond is not a safe asset unless "stability of market value" is not a component of safety. To me, this means that we'd be better off with different nomenclature. Perhaps. Gorton uses the clumsy "informationally insensitive" nomenclature. "In other words, a safe asset is an object with attributes that traders can mutually agree on very quickly and at little cost. " Would traded commodities like lumber, coffee, iron ore, cotton, and crude oil also qualify as safe assets? The first thing to keep in mind is that the list of attributes to consider is not limited to the object's physical properties. The legal attributes are also important. In the case of Bitcoin and cash, possession is ownership, and that's important. The other thing to note is that the commodities you listed above are not necessarily super simple (I'm from the west coast so I'm familiar with the various grades of lumber, for example). In this comparison traded commodities lack a few key features that bitcoin has. Commodities are not as divisible and also their value changes depending on geographic location and their form. 0.001 BTC has the same value as one thousandth of 1.0 BTC. 0.00001 ton of cotton does not equal 1 ton of cotton divided as many times. Picked cotton has a different value from cotton balls, cotton fabric, cotton plants. BTC when mined is instantaneously the same value as any BTC anyone else holds across the markets. This is because bitcoin is purely digital. David, great write-up. The part where you say "possession is ownership" is a very important insight that isn't widely understood. I would go further and say "possession" of bitcoin (i.e., knowledge of the secret key) is even more powerful than possession of cash. It's conceivable that a person could find a pile of cash and be deprived of it by legal channels because it is clearly not their cash. With bitcoin, on the other hand, if an owner is sufficiently diligent they can prevent any kind of transfer of their bitcoins, even under duress (using e.g., dual signature). In a sense, "ownership" of bitcoins is ownership in its purest sense. It is ownership that does not require a legal framework or apparatus of coercion (typically the state), to enforce. You're right that lumber isn't super simple; I'm from Alberta so I know that there are many different grades of crude oil too. I think what your talking about is a combination of fungibility and verifiability. Even bitcoin isn't entirely fungible. Virgin coins that haven't been used yet may attract a premium since their source isn't dubious. Anyone who accept bitcoin that has been used in a nefarious manner could be on the hook for returning it to its original owner. I suppose there are degrees of fungibility/verifiability with central bank cash probably possessing those features more than most. Can you explain your last paragraph more? I'm just learning about the blockchain, so I'm not clear how one can identify if a bitcoin has been used for a nefarious purpose. Also, I'm from SK. Between you, me, and David, we have all of Western Canada! Or at least the part that counts. Manitoba has always been that weird cross-over province. I think JP is referring to the fact that technically, each "bitcoin" is *defined* by its entire transaction history (from wallet to wallet) since the day it was created. Bitcoins with a long history have a better chance of being linked to specific identities. "Virgin" (newly issued) coins have no such history and so may trade at a premium. Whether they do or not is an open question. I have heard that they do, but that the premium is small. But mostly they all trade at par, I think. The greatest difference in the asymmetry of bitcoin vs that of crude oil, for example lies is their supply. It is known by all that only 21 million bitcoin will ever exist. Insiders in the crude oil industry have greater information about the supply, which includes things like reserves, extraction tech, storage levels and tech, etc. But the critical difference between bit coin and dollars is the imposition of gov taxes (and private debt) only payable in dollars. This creates the baseline value of a currency IMOP unless it is backed by something of intrinsic/ tangible vale. So arguably dollars do have intrinsic value because you need them to keep your property from being seized or going to prison. I just dont see how bit coin ever has this feature. Imagine if it became illegal to convert bitcoin into any form of legal currency? Wouldnt the value instantly fall to 0? No, it's value would not fall to zero. There may be no need to convert BTC to USD. What if all vendors just started accepting BTC, for example? There are many examples of governments imposing currency controls. They make life more difficult for the competing currency, but they do not generally extinguish its use. And BTC has a great advantage over traditional currency substitutes -- you can use in using your phone via the internet. > Imagine if it became illegal to convert bitcoin into any form of legal currency? Wouldnt the value instantly fall to 0? Only if the technology is no longer useful or scarce (here referring to "bitcoins" - the internal unit of account). Take the American "Underground Railway" as a decentralized, old school example. If it were marked "illegal", did it no longer have utility? Pragmatically speaking, not idealism. If something is both useful and scarce, it will also command a price in the market. You can debate *what* that price should be, but not that there exists some price, and that it's greater than 0. Falling to zero may have been an exaggeration. I know my mom was selling her old beanie babies for a quarter a piece recently so yeah there would always be some price. Im kidding but also dont think the comparison is really that far off. Do bitcoins have some sort of utility outside being a unit of account and a more anonymous payment system (I genuinely don't know)? I personally see the utility of a currency and the utility of a payment system as independent concepts... Would bitcoin theoretically be any different than someone setting up a spreadsheet that tracks who has how much of any unit and saying there will only be 1000 of such units? They then sell entries on the spreadsheet into the market, meanwhile they profit from appreciation (i.e. ponzi scheme)I can see how someone could convince people to purchase these units through marketing/sales, but I dont see how the the actual units would have any tangible intrinsic value. I guess it just depends on if you believe money has value due to people needing it to pay taxes and "derivatively" speaking private debt, or if it is valuable simply because we simply accept it is. I know there is not universal agreement on this issue. Sorry also meant to say... My hypothetical in which it was "illegal" was meant to be illustrative. Trading "illegal" for "impossible" makes my point more clearly. I just dont see how the value is sustainsble outside of people's, in my opinion misguided, perception. The strength of bitcoin seems to rely entirely on marketing prowess, and value fluctuations will probably continue to be highly volatile. Sean, I encourage you to read up on Bitcoin, what it is and how it works. You may as well start with the original Satoshi white paper. I provide a link to it in my post. Great article! FWIW, I agree with the premise of this article that Bitcoin has the potential rise as a store-of-value type asset. That said, I'm curious - do you require Bitcoin to be a payment-processing system comparable to Visa's in order for it to achieve money status? Thanks! In answer to your question, yes. Do you consider gold to be money? If so, it doesn't have a payment processing network comparable to Visa's. Why is it different? If you don't consider gold to be money, I'm assuming you consider it to be a store-of-value asset without money status? I define "money" as an object that circulates widely as a medium of exchange. If you accept this definition, then gold has been money in the past, but is not money today. To test the veracity of this statement, try buying your morning Starbuck's latte with gold (bullion, coin, jewelry, etc.) and see what happens. Yes, I consider gold to be a store of value asset. A superficial payment layer the likes of Lightning will eventually bootstrap the use of Bitcoin as money and eventually enshrine it as a unit of account. That will be long after Bitcoin has appreciated enough to satisfy the liquidity needs and mitigate its fluctuations. David this is a brilliant article and it was a pleasure to read it. Props. As I've cross-commented to you on Twitter you have aptly distilled the important yet unheralded reason why Bitcoin is such an innovation. A perfect ledger of accounts. I also found it to be a brilliant commentary on its superiority to gold as well. With Bitcoin, an unparalleled transparency provides for near perfect information asymmetry by way of its open, mathematically enforced, economic protocol. My only quirk with your post is the bit about the "simplicity" of Bitcoin. Indeed, the open-source code is something that needs thorough verification by proper experts. On that note one should be wary though of making lazy parallel with central command of the economy or in other words a digital "tyranny of the experts". The Bitcoin development ecosystem is one concerned with hard science of cryptography, system engineering & computer science. A very healthy meritocracy. So, to return to our "simple" matter. The cornerstone anchoring the notion of assessing the reliability of bitcoins traded is the work performed by validating nodes. By storing the entirety of the ledger and enforcing the network consensus rules for every transactions that comes their way, they provide the sole instrument with which one can independently verify the nature of his money and protect himself from counterfeits. More importantly that is achieved in absence of any counterparty risk whatsoever. This process is fundamental to the value of Bitcoin and its ability to provide previously unseen monetary sovereignty. It is the root of the "disturbance" you refer to. Some people, by way of centralizing control of these validating nodes, would rather trade efficiency for trust and in our frame, information. I am sure you can deduce the danger brought about by centralizing authority of validation.... A surefire way to make Bitcoin a less "safe" asset, wouldn't you say? I'm not exactly sure why my notion of "simplicity" irked you (even mildly). It's neither a necessary or sufficient condition for an asset to be considered "safe" in the sense I defined. For example, Robert Mugabe had a very simple and transparent monetary policy: hyperinflation. The Bitcoin development ecosystem is one concerned with hard science of cryptography, system engineering & computer science. A very healthy meritocracy. More importantly that is achieved in absence of any counterparty risk whatsoever. Well, this is an assertion that may or may not be true. It's very hard for the uninitiated to know whether it is true. Only experience (reputation building) will tell. In any case, I think there are counterparties involved--the miners. They may have incentives in place to keep them well-behaved, but this is not something that is God-given. Also, to the extent that people find it more convenient to use intermediaries like Coinbase, there is counterparty risk associated with the endeavor. I'm not saying it's big, just saying that any system has it's vulnerabilities. In terms of the "danger" of centralizing authority of validation, I'm not so concerned. I trust my bank to keep a good record of my accounts. I may not always like what they charge me for the service, but I trust them to keep my money safe, process my transactions, etc. Whether or not one trusts the monetary policy rule is another matter. But again, I think that trust comes with a record of good performance. The USD is high demand today in large part because people trust the Fed to keep inflation low and stable. Having said this, I think it's great that there are competing monetary systems out there. I don't see this as an either or situation. The history of money and payments is one of mutual coexistence. For example, there are presently thousands of local currencies in circulation. Of course, there are hundreds of national currencies. I think that Bitcoin is a valuable addition to this club. If it ends up being dominant because of its superior qualities, I'll be the first one to be asked to be paid in the stuff! Interesting to see this from a Fed staffer. I am actually pleasantly surprised in a positive way he recognizes the value proposition as a store of value. I disagree on his view with respect to money mainly because I disagree with how he defines money. Are Federal Reserve note debt instruments hard to counterfeit? Hell no. Twelve Fed members can print new ones whenever they please and who knows what happens behind the scenes. Nonetheless, I appreciate his contextual argument vis a vis Visa (no word pun intended). Bitcoin has a long way to go. It is like a vacuum cleaner sucking up the global aggregate amount of Money of Exchange. If it's market cap ever exceeds this amount then perhaps it is a bubble. However, at that point who cares??? Just use Bitcoin for a store of value and day to day living. What's the eit strategy for gold? If gold bugs get their day and it costs $10,000 Federal Reserve note debt instruments to buy one ounce of gold then why on earth would one want to "cash out" back into FRN? Save the time and just buy Bitcoin now. Fed notes are hard to counterfeit because if they weren't, they'd be worth nothing. for it do be used as money. In this sense when I refer to counterfeit I am not just focusing on the physical construction and creation of additional notes (though that is certainly much easier than duplicating the same Bitcoin already mined). I refer to the insane status quo where twelve humans can sit in the Ivory Tower and with a click of the mouse create new "money" out of thin air. I toss this back to you. If a small, select group of humans can print trillions of new FRN as they please at any time then how much can they be worth? Granted it is not THE unit of account currently but is fully capable of filling that role over time. Same with medium of exchange. It appears you did not read my post. We all create promises "out of thin air" all the time. That's a red herring. You also do not understand how the FOMC works, how it is constrained by the FRA put in place by your elected representatives. How much can a USD be worth you ask? Look around. It seems to be in high demand as far as I can tell. The Federal Reserve is constrained? I understand you may feel obligated to be loyal but nobody believes the Fed is constrained. 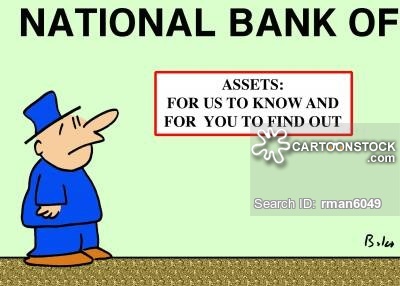 $15T to bail out European banks? Just look at the Fed's balance sheet. What is the Fed levered at currently anyways, about 90/1? That is only using what is available for public use. I can only imagine what is really under the hood. I am an academic and my only loyalty is to the truth. As for your $15T figure, you are just making numbers up. Yes, just look at the Fed's balance sheet: $4T of interest-bearing assets making a nice profit for the US taxpayer. The Rat is genuinely puzzled as to why Banks are looking at creating private blockchains, which re-introduce human fallibility and the ability for a bad actor to try and corrupt the system, with no financial cost disincentive. "Private" and "Permissioned" blockchains will all fail miserably. It is merely more of the "extend and pretend" strategy deployed by the status quo. Can JP Morgan throw around $20M in FRN debt notes to try and create fear and uncertainty over Bitcoin? Of course they can. Time will show that Bitcoin is the Blockchain. The banks want to distract the masses and make them believe that Bitcoin has little value but that "blockchain technology" as displayed in their consortium's offering is "awesome" . . . . . . as long as the bankers get to make it centralized and under their control. Is this about bitcoin core or bitcoin classic? Is this pre or post China having > 50% of blockchain hash power? 2014 was a rough year in Bitcoin’s history, maybe the worst ever. The official collapse of Bitcoin’s largest exchange, Mt. Gox started the year. Bitcoin market values dropped like a rock for the next year, spilling into early 2015. And the ball- and-chain to beat all regulatory ball-and-chains, BitLicense, hit Gotham, destroying any hopes of New York becoming a 21st-century fintech hub, like London aims to. The executioner who spearheaded this death blow was Benjamin Lawsky, former head of New York States' regulation of financial services. Since his detonation of BitLicense, he has left the state of New York and the digital currency limelight, until now.